With Republicans in Washington, D.C., determined to gut healthcare access for millions of Americans, Michigan Democrats want to secure state-level protections. As the push to repeal and replace the Affordable Care Act marches forward in the U.S. Senate, there’s one thing most Americans can agree on: They like the protections the ACA enshrined into law (even when you call the ACA by its informal name, Obamacare). But the Republican plans in both the U.S. House and Senate threaten to erode or eliminate those protections, leaving millions of Americans without access to the kind of quality, comprehensive health insurance coverage the ACA guarantees. That’s why Democrats in Michigan want to pass a resolution that would guarantee the protections codified into Michigan law by the ACA no matter what happens. The “Health Care Bill of Rights” introduced by Michigan House Democrats and Michigan Senate Democrats would ensure that people with pre-existing conditions won’t lose vital protections and seniors who aren’t eligible for Medicare won’t see changes that would force them to pay five times more for healthcare. The plan, which the entire Democratic caucuses in the House and Senate have already signed on to, also protects people with employer-based health insurance from drastic rate increases and coverage caps. All of these scenarios would be the reality under any plan currently on the table in Washington, D.C. According to House Democratic Leader Sam Singh, the Republican plans would have a significant impact on Michigan. Both the House and Senate plans push a lot of the decision-making down to states. If that’s going to be the case, we want policy-makers on record. This should not be a partisan issue. Anyone who says they care about protecting seniors and people with pre-existing conditions and claims they are committed to keeping healthcare costs down should support our resolution. 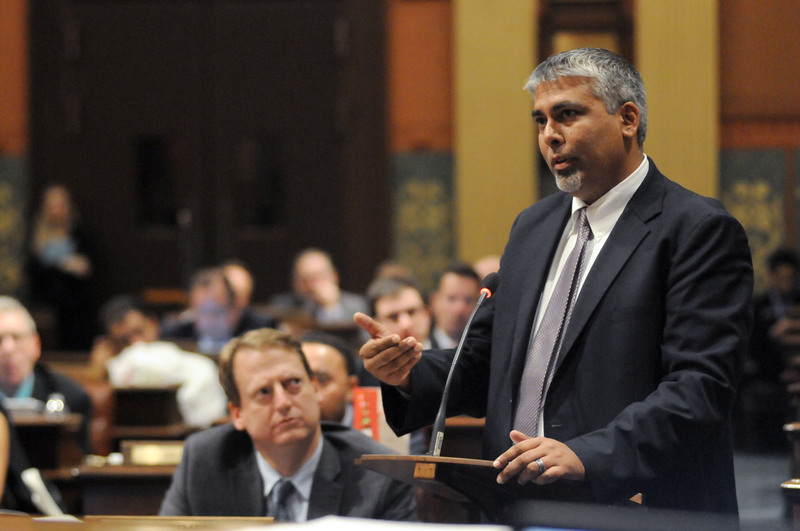 One of the most troubling aspects of the plans proposed by the U.S. House and Senate would eliminate Medicaid expansion, dubbed the Healthy Michigan plan, says Leader Singh. The Healthy Michigan plan has been a resounding success by every measure. It has brought down uncompensated care at hospitals and has given more families access to healthcare. It would be a devastating loss to the people and the medical economy in Michigan that has been sort of built around the ACA. We’d see a lot more uncompensated care driving people back into emergency rooms for routine care, which would drive up premiums for everyone who is paying for insurance individually or through work. According to Leader Singh, up to one million Michiganders would be impacted if the plans being discussed in Washington, D.C., become law, either because of the elimination of the Healthy Michigan plan or the significant increases in premiums and costs that are predicted under the current proposed legislation. Protects People with Pre-existing Conditions. The plan prevents people with pre-existing conditions from losing their protections. Republicans have proposed getting rid of or reducing essential health benefits, which include treatment for pre-existing conditions like cancer or asthma. Republicans have also proposed allowing insurers to impose drastic increases in rates on those with pre-existing conditions and penalize them for gaps in coverage. Stops the Republican ‘Age Tax.’ The plan protects seniors and older people who aren’t eligible for Medicare by banning insurance companies from jacking up their rates. Under the GOP’s plan, seniors would be forced to pay five times more than what other people pay, compared to the maximum three times more allowed under the ACA. And millions of people would lose tax credits, causing their rates to skyrocket even more. Prevents Massive Rate Hikes. The plan stops insurance companies from being able to jack up rates on people who get sick and need treatment or add coverage caps, which leave people with massive out-of-pocket costs after their benefits run out. Protects Essential Health Benefits. Insurance companies won’t be able to deny Michiganders coverage for maternity and newborn care, prescription drugs, substance use disorder services, preventive care, pediatric services, hospitalization and emergency services. Prevents Annual or Lifetime Health Care Coverage Caps. Insurance companies will not be allowed to go back to the days where they could impose coverage caps on health coverage — a limit on what they will pay — forcing many people, even those with employer-based health insurance, into bankruptcy in order to get treatments they need. Although the focus is rightfully on what happens next on Washington, D.C. — and constituents are urged to contact their Senators to urge a “no” vote on the proposed legislation to repeal and replace the ACA — Leader Singh asks Michiganders to reach out to their state representatives now to ask where they stand. Ask if they’ll commit to protecting people with pre-existing conditions. Ask if they’ll refuse to add an ‘age tax.’ We want people to hold their local officials accountable. We’re always hopeful the federal government will do the right thing — fix the ACA without throwing out the whole system — but the Senate bill doesn’t do that. Beyond calling your representatives in D.C., add that step of talking to your local legislator. People will be running for election next year and it’s very possible that will be the class of legislators that will be making these decisions. The time to start having those conversations is now. Learn more about the Health Care Bill of Rights and what’s at stake — and sign a petition in support of the resolution — at protectmihealthcare.com. Author: Amy Lynn Smith Amy Lynn Smith is a writer and communication strategist. Find her at alswrite.com or on Twitter at @alswrite.